Most of us take for granted that those rectangular green slips of paper we keep in our wallets are inviolable: the physical embodiment of value. But alternative forms of money have a long history and appear to be growing in popularity. It's not merely barter or primitive means of exchange like seashells or beads. Beneath the financial radar, in hip U.S. towns or South African townships, in shops, markets and even banks, people throughout the world are exchanging goods and services via thousands of currency types that look nothing like official tender. Closer to home, "Ithaca Hours," with a livable hourly wage as the standard, were launched during the 1991 recession to sustain the economy in Ithaca, N.Y., and stem the loss of jobs. Hours, which are legal and taxable, circulate within the community, moving from local shop to local artisan and back, rather than leaking out into the larger monetary system. The logo on the Hour reads "In Ithaca We Trust." Alternative (or "complementary") currencies range from quaint to robust, simple to high tech. There are Greens from the Lettuce Patch Bank at the Dancing Rabbit Ecovillage in rural northeastern Missouri. 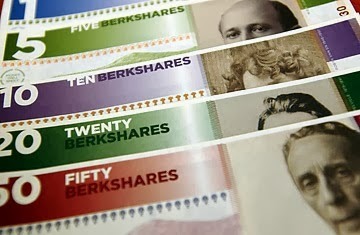 In western Massachusetts one finds fine-artist-designed BerkShares, which are convertible to U.S. dollars. More than $2 million in BerkShares have been issued through the 12 branches of five local banks, according to Susan Witt, executive director of the E.F. Schumacher Society, the nonprofit behind the currency. And in South Africa, proprietary software keeps track of Community Exchange System (CES) Talents; one ambitious plan is to make Khayelitsha, a vast, desolate township of perhaps 1 million inhabitants near Cape Town, a self-sustaining community. An alternative currency is generally used in conjunction with conventional money; one may use local currency at the farmers' market and regular greenbacks at the supermarket. "It doesn't try in any way to replace cash," says Christoph Hensch, a Swiss national and former banker living in Christchurch, New Zealand. Rather, it offers a way "for people to share and redeem value they have in the community." He says the currencies are most useful in geographical areas or social sectors where money doesn't flow sufficiently, citing, for example, New Zealand's Golden Bay, which is so remote that it sometimes nearly functions as its own economy. Advocates of alternative currencies say they are a means of empowerment for those languishing on the margins of fiscal life, granting economic agency to people like the elderly, the disabled or the underemployed, who have little opportunity to earn money. For example, in some systems one can "bank" Time Dollars for tasks like child care and changing motor oil. It's not whether you're employed or what financial assets you have that matter, says Les Squires, a consultant on social-networking software who has been working with groups developing alternative currencies. Each person has "value" that is "exchangeable" on the basis of time spent or a given task. Since the introduction of the European single currency, 23 different regional currencies have started circulating in Germany as people aim to revitalize local economies, lessen dependence on the euro, and challenge the established global monetary system. At least 40 more are in development. The individual currency systems vary, but they do share some common features. For example, retailers who accept them usually agree to bear a small loss — around three to five percent — in exchange for the increased business the currency is supposed to provide. Most of the currencies also lose value over time if they are not spent, supposedly an effort to encourage people to spend more. Some of the currencies also help fund charitable activities. The phenomenon of alternative currencies is spreading, and not only with the (current) worldwide success of the bitcoin, which is growing more popular in the Netherlands. In the Netherlands, Amsterdam has the makkie, which started up in 2013, joining the older noppes currency from the nineties. In the last three years, plans have been made to get the gulden in Groningen, gelre in Gelder, achthoeker in Achterhoeke, zonnemunt in Leiden, bataaf in Nijmegen and schokker in the Noordoostpolder off the ground, with varying amounts of success. Now people in Rotterdam have developed two different local currencies to the euro. Europeans are fed up of austerity, and there is a growing distrust of the Euro. Increasingly people are turning to alternative currencies and barter. In France more than 20 complimentary currencies are in everyday use across the country. The video is a good overview of what is happening in Europe right now. The details on alternative currencies start at 2.13 into the video.